SUSBEXPO is the first conference about unmanned systems to really focus on the growing commercial opportunities of this market. AUVSI put on a spectacular annual show, but it is predominantly military systems. SUSBEXPO is the brain child of Patrick Egan, who is a UAS business consultant, as well as being deeply involved in AUVSI, SUASNews, building on a background with the military and regulatory groups. The conference was held at the Golden Gate Club in San Francisco on July 25-26 and attracted attendees from all over the US and beyond. UAVs were on exhibit from companies like 3D Robotics, AgriFlight and MLB Drones, and Patrick Egan is expecting SUSBEXPO to be even larger next year. Eileen Shibley from the California UAS Portal talked about the pathway towards becoming one of the 6 FAA UAS test sites, which has included becoming a hardware business incubator with rapid prototyping and manufacturing facilities to extend the Portal’s utility for both clients and the community around Inyokern Airport. Jonathan Downey, Airware CEO, saw the increasing pressure for commercialization as an opportunity to create responsive and accessible cross platform UAS software, disrupting the costly inflexible blackbox autopilots generated by a military chokehold on UAV business. At the moment, unmanned system business is shaped by the triumvirate of military funding, the slow path towards an FAA certification system and ITAR, the International Traffic in Arms Regulations. Under export law, all unmanned systems and componenents are considered weapon systems and can’t be sold or operated with, or around, foreign nationals without very costly and difficult-to-get approval. By and large, the military is the only customer rich and patient enough to go through this process. Meanwhile, domestic commercialization is still on hold waiting for an FAA regulatory structure to emerge. Tad McGeer, Aerovel CEO, said that ITAR applies to ALL robotic aircraft regardless of application, and this effectively forces all small businesses to become military arms dealers instead of small businesses. McGeer points out that the UAS industry is still mostly made up of very small businesses, and that direct competition with manned aircraft is a long way off. The end-user cost per flight-hour, even with cost reductions, is still not competitive. UAS startups need to look for a niche. Some of the characteristics of favorable niches are reductions in aircraft, startup and logistics costs, greatly improved reliability and ease-of-use, offshore and remote areas, scope for miniaturization, parallel operations with multiple aircraft and high utilization. Chad Partridge, who is a Board member of AUVSI, as well as founder of Sensing System and VP of 2D3 Sensing, placed the current regulatory confusion and public angst over drones in parallel with the history of the automobile. Drones are part of a moral debate, and the industry is being regulated around some very negative perceptions. In hindsight, our common perception is that there was immediate acceptance for automobiles because we can no longer imagine a society without them, however there were decades of conflict over the role of motor vehicles. Before the city streets were physically reconstructed for automobiles, the social landscape had to be built. 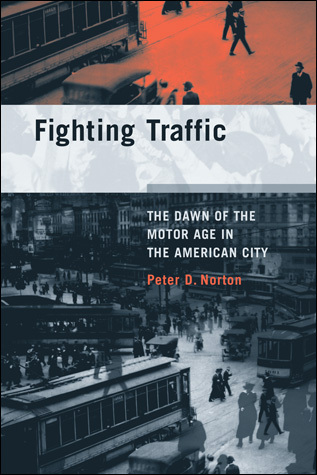 Partridge recommends “Fighting Traffic” by Peter Norton, Assistant Professor in the Department of Science, Technology, and Society at the University of Virginia. Norton examines a range of perspectives during the period from 1900 to 1930, from police who had to become ‘traffic cops’, city planners who tried to regulate traffic, parents and pedestrians who campaigned for ‘safety’ and ‘justice’ over the loss of the street in sometimes violent opposition to automobile interest groups who, themselves, invoked the rhetoric of ‘freedom’. Partridge suggests that the lessons learned from the automotive past are the importance of banding together as an industry, promoting better narratives, and steering legislations and standards. Industry solidarity and networking are things that organizations like AUVSI and Silicon Valley Robotics can play an important role in. As the AUVSI report from March 12 2013 explains, agriculture is the optimal vertical for unmanned systems at the moment, and can deliver billions of dollars of economic value alongside thousands of jobs and the social good of reduced pesticide/fertilizer use. The barriers to entry are lowest and the potential returns are the highest in this market. There were several speakers focussing on aspects of this area including Chris Anderson of 3D Robotics, one of the fastest growing venture backed robotics startups in the Valley. 3D Robotics has iterated from a DIY community supplier to a consumer robot company, and now to a data and payload service provider. 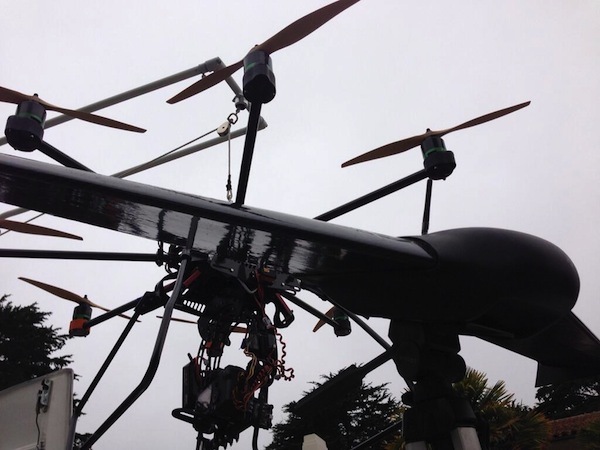 As Chris Anderson asked, what is drone data good for? Vineyards currently use an analog sensor technology that has been unchanged for thousands of years. There is a rose at the end of each row of grapes and the rose is an early warning for fungal infections. Drones can expedite our emerging ‘Big Data’ capabilities in agriculture, which is the largest industry in the world. Half of our agricultural inputs (e.g. water, fertilizer) are being wasted because the cost of not treating is greater than the waste cost. Knowledge of where there were leaks in the system would allow for adjustment and an opportunity for closed-loop farming. Farmers want this but they don’t necessarily care about the technology that delivers the data. Drone developers need to talk to farmers in order to create custom trusted solutions. The folks at 3D Robotics have been talking to a lot of farmers in the last year and have found that each farm is different, not just each crop. Anderson says that companies need to build a community interface and offer a multi-solution package. For example, a farmer should be able to deploy a rover or a copter or a fixed wing system with equal ease, depending on requirements. It should be as simple as picking up a tablet, drawing your boundary, pushing a button to go. The industry is still at a very early stage, with most customers in it ‘for bragging rights’ rather than economic benefit, however in a short time there should be a bank of success stories to draw on that will support future growth. The market opportunity is in delivering insight, not just drones. It’s about image acquisition, processing and locating. Georeferencing is a significant field opportunity. Data may be freely available but it’s the processing and the insight that offers huge commercial opportunities. While SUSBEXPO was primarily about drones, and a majority of the established companies are still defence-funded, it seems clear that a change is underway. The timeliness of the event was mentioned by many of the participants, who came from across the world, as far afield as Australia and the Cayman Islands, and who crossed disciplines from engineering to education, from entertainment to law. One of the speakers, Matthew Schroyer, is the organizer of ‘drones for journalism‘ which not only destigmatizes drones in the media by highlighting humanitarian and libertarian use cases but is also the professional association for the newly emerging field of drone journalism. As technology changes, professions change in response and Schroyer talks about the ways that journalism must evolve to make use of new data. The Reuters Institute for Journalism in the UK recently released a report on the implications of the increasing use of drones and ROVs in journalism. The report notes the tension between audience expectation for full media coverage of events and the increasing ease and affordability of deploying drones alongside privacy and safety concerns. 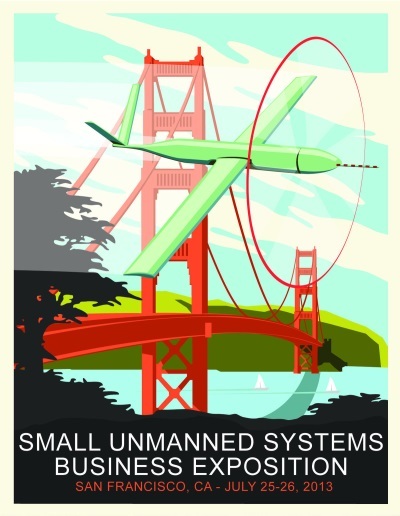 In the words of conference organizer Patrick Egan, SUSBEXPO will return in 2014 to further ‘federate and promote the unmanned systems community’.